Andrew Sims saw the giant ice disk had stopped moving so he grabbed his paddleboard and decided to do get it moving. 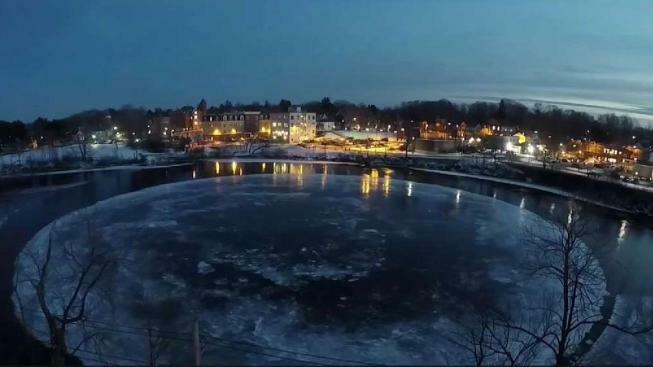 Maine's giant ice disk is spinning again thanks to one man's efforts. The roughly 100-yard (91-meter) wide disk became lodged against the river's edge, preventing it from moving. Andrew Sims says he saw what happened and decided he had to do something about it. "I just think it's great for Maine. Once I saw it on national news, I said, I gotta check it out, and then once I saw it wasn't spinning, I said we gotta get it spinning," Sims said. "So I gathered my resources and, uh, took my paddleboard out and jumped on it, took a couple hours and it's moving." Sims, a photographer, says he wanted to get a timelapse of the disk moving at night. "It's exciting," he said. "It's just a really neat event." Sims said people who had gathered near the river clapped as he worked to free the disk Thursday night. "Everybody clapped," he said. "They were encouraging me as I was getting around because it took a while." Adding with a laugh and a thumbs up, Sims said, "I'm the hero, yep." NBC10 Boston/necn Meteorologist Michael Page says the disk may not last through the weekend given the winter storm expected to arrive Saturday night. Page says the disk could freeze in place because of how much cold air is coming in on the backside of this weekend's storm. Experts believe these disks form naturally when there's a circular current that creates a whirlpool effect.